this past week has been a smorgasbord of events! i actually missed several—dapat lang noh, baka ma-overexpose ako bwahahaha! just the other night, i had invitations to five events! and i actually attended three! thank god, they were all in the same area—bonifacio global city. that was thursday, event organizers' favorite day. that night, i went to the opening of promod in bonifacio high street central, cosmopolitan philippines' 15th anniversary at NBC tent, and metro magazine's 23rd anniversary at privé. let's start with promod, a french ready-to-wear brand. i didn't realize this was their 10th branch in the philippines. i only know of the one in greenbelt 5. and the one in paris, naks. 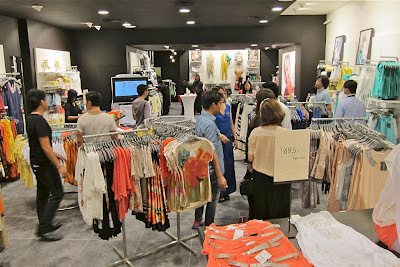 they had a mini fashion show inside the store to give the guests some idea of how to style the pieces in the current collection. let's break it down! and since i had two more events to attend afterwards, i shopped for something to change into! got a gold tank top from promod. 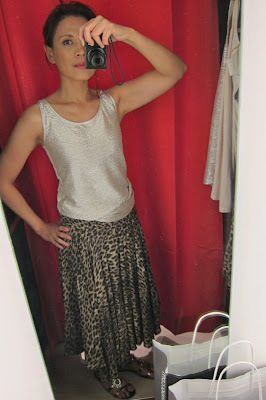 to go with that, i just hopped across to ever new (both stores are owned by the same local distributor) and picked up a leopard-print strapless dress with handkerchief hem that i pulled down into a skirt—two for the price of one!